On '60 Minutes,' Trump Talks Possible Mattis Exit, Climate Change And Kim Jong Un The president sat down with CBS' 60 Minutes for the first time since entering the White House. In the wide-ranging interview, he also discussed his views on NATO and Saudi journalist Jamal Khashoggi. President Trump, shown in the Oval Office at the White House earlier this month, appeared on Sunday's 60 Minutes. 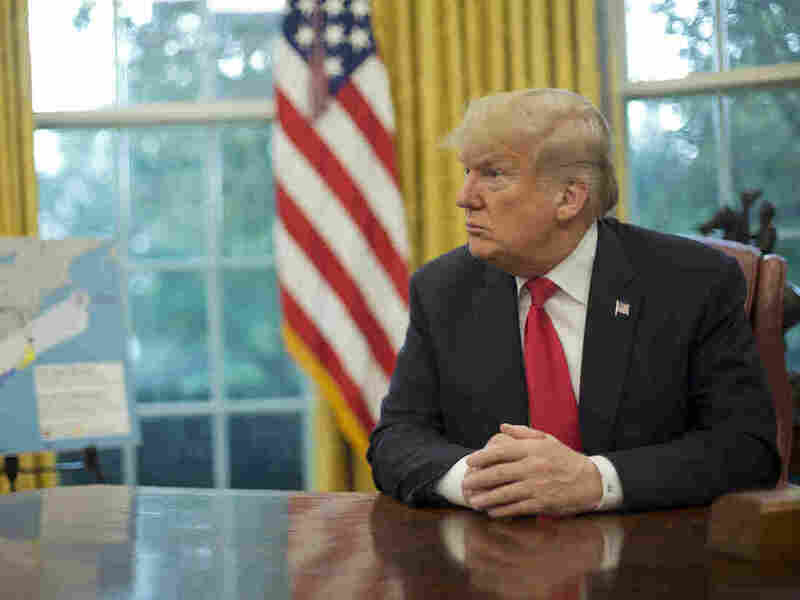 Defense Secretary Jim Mattis "could" be considering a departure, Saudis can expect "severe punishment" for any involvement in the disappearance of Jamal Khashoggi, and climate change is probably real, but not caused by man, President Trump said in an interview aired Sunday on CBS' 60 Minutes. The wide-ranging discussion with the network's Lesley Stahl touched on Trump's opinion of politicians ("deceptive, vicious"), Chinese tariffs and Christine Blasey Ford, among other things. The show interviewed him in the White House last Thursday; the interview aired on CBS on Sunday night. The president was previously interviewed by Stahl for 60 Minutes in Trump Tower with his family in 2016, days after the election. Stahl has interviewed Trump as a candidate, as president-elect and now as president. "In terms of the three interviews, he was completely different," she said. "He's so much more confident. He is truly president. And you felt it. I felt it in this interview." Trump often pushed back at the journalist when she asked him to elaborate. "In the meantime I'm the president and you're not," he said after one exchange about the press. Mattis is visiting Vietnam this week, as China continues its growing military assertiveness in the South China Sea. Trump, perhaps opening the door to Mattis' exit, told Stahl that the defense secretary "could" be considering a departure from the Cabinet. She asked the president if Mattis was going to leave. President Trump: — a very good relationship with him. It could be that he is. I think he's sort of a Democrat, if you want to know the truth. But General Mattis is a good guy. We get along very well. He may leave. I mean, at some point, everybody leaves. Everybody. People leave. That's Washington. The president also decried claims of chaos in his administration as "fake news." "I have people now on standby that will be phenomenal," Trump said. Other world leaders are grappling with the Turkish government's allegations that Khashoggi was killed by Saudi officials in Istanbul this month. Trump threatened "severe punishment" if the allegations are true. The president said the Saudis have denied involvement and that he expects to know why Khashoggi disappeared "in the not-too-distant future." "Boeing, Lockheed, Raytheon," he said, referring to U.S. defense contractors with business in Saudi Arabia. "I don't want to hurt jobs. I don't want to lose an order like that. There are other ways of — punishing, to use a word that's a pretty harsh word, but it's true." "There's a lot at stake. And maybe especially so because this man was a reporter," the president said. "You'll be surprised to hear me say that. ... We're going to get to the bottom of it and there will be severe punishment" if he was murdered. Stahl sparred with Trump in the aftermath of Hurricane Michael, citing the recent trend of powerful storms. Trump has called climate change a hoax perpetuated by China in the past, but in the interview, seemed to partly reverse his position. "I think something's happening," Trump said. "Something's changing and it'll change back again. I don't think it's a hoax," he told Stahl. "But I don't know that it's man-made. I will say this. I don't want to give trillions and trillions of dollars. I don't want to lose millions and millions of jobs. I don't want to be put at a disadvantage," he said. "Look, scientists also have a political agenda," he added. The president's remarks about North Korean leader Kim Jong Un have frequently made headlines. At a rally in West Virginia last month, Trump told the crowd about the "love" he has developed for Kim. "He wrote me beautiful letters. And they're great letters. We fell in love," he said. Just a year earlier, Trump had mocked Kim as "Little Rocket Man" while Kim returned the insult, calling the president a "mentally deranged U.S. dotard." Stahl pressed Trump on those September comments. Stahl: I want to read you his resume, okay? He presides over a cruel kingdom of repression, gulags, starvation — reports that he had his half-brother assassinated, slave labor, public executions. This is a guy you love? President Trump: Sure. I know all these things. I mean — I'm not a baby. I know these things. Stahl: I know, but why do you love that guy? President Trump: Look, look. I — I — I like — I get along with him, okay? President Trump: Okay. That's just a figure of speech. President Trump: It well, let it be an embrace. Let it be whatever it is to get the job done. At a rally in Mississippi earlier this month, the president mocked Ford, who has accused Supreme Court Justice Brett Kavanaugh of sexual assault. "I'm not gonna get into it because we won," Trump eventually answered. "It doesn't matter. We won." The U.S. has already imposed about $250 billion in tariffs on China, and there "might" be more on the way, the president said. He's not trying to push China into a depression, he said. "I want them to negotiate a fair deal with us. I want them to open their markets like ... our markets are open." Chinese officials have said in the past they are prepared to retaliate with higher tariffs of their own. "They want to negotiate," the president said. "I have a great chemistry also with President Xi of China. I don't know that that's necessarily going to continue. I told President Xi we cannot continue to have China take $500 billion a year out of the United States in the form of trade and others things." A previous version of this story misspelled North Korean leader Kim Jong Un's name as Kim Jung Un.